Go to the Customizer -> General Settings -> Background Image. The background image is the image that appears when the web page/content section background is set to transparent. Otherwise, if a web page/content section background has been previously set to display an image, or it is filled with a color, the background image set from General Settings won’t be displayed. 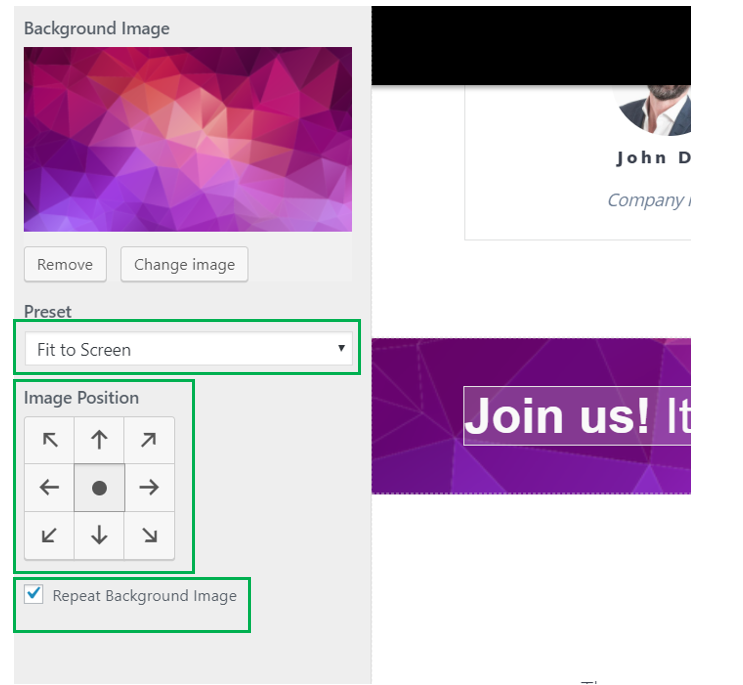 Be sure the content section where you want the background image to appear is set to transparent (in the Customizer -> Manage Page Section -> Edit -> Section Background -> Background Type). Upload an image you select from your computer. You can change the image any time, or you can remove it completely. Repeat Background Image – you have the option to check the checkbox and enable repeating background image. If you select Preset -> Repeat, you have the additional option to scroll with page. If you select Preset -> Custom, you have to set the image size (Original, Fill Screen or Fit to Screen), you may choose to repeat background image and/or scroll with page.